Join the discussion on our forums! 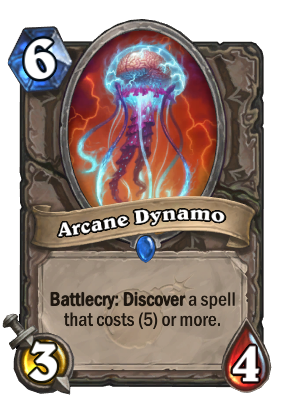 Come discuss Arcane Dynamo over in our dedicated Arcane Dynamo discussion topic. "Because yours are definitely the last 2 cards in your deck against this Odd Paladin, here's a Spreading Plague xoxoxox"
EXTREMELY useful in Even Shaman, especially in Wild. Everyfin is Awesome and Bloodlust are the two best picks. My advice: Bloodlust for final burst, Everyfin for a beefier, more threatening board. A weaker Ethereal Conjurer with built in high roll, nice. For whatever reason, I believe in this card. Maybe I'm just a sucker for cards that give you more cards, but this card will find a pretty okay purpose in a deck at some point. Could be used to get a Bloodlust in Even Shaman... maybe??? 60% chance to get Bloodlust if my math is right. Seems useful in even shaman. I feel like this will be super busted in even Shaman. You fill your board pretty easily and you get to discover Bloodlust or The Storm Bringer which are both amazing (and that you can't normally run because they are odd cost). Add to that the Menacing Nimbus that gives you a target for Earthen Might and I can see that deck getting a nice bump in power level.. Not sure if it will be enough in Standard, but it should in Wild. Great, another way for Druid to get extra copies of OP spells. How am I supposed to deal with 4 Webweaves?! I was a bit hyped because it curves so well into Psychic Scream till i looked into priest's pool. First the Storm Chaser and now this? Oh legendary Shaman Spell, what secrets do you hide? There are some classes with just a few high cost spells, I think might be useful in those, because discover almost guarantees a good card in those... Like in Warlock you are guaranteed to get Twisting Nether or Siphon Soul or both as a choice and pick whichever works better. IMO, this card isn't as bad as most people vote it to be. Sure it might only see fringe play in budget decks and maybe some competitive decks due to its abysmal stats, but it's Battlecry is much better than most people might make it out to be. Including the cards revealed so far, 7 out of 9 classes will rarely ever have bad outcomes. Do bear in mind that this is a discover, so a class just needs at least half of the cards to be at least decent in order to have no bad outcomes most of the times. Edit: Will not be including Wild Cards. There're just so many. TL;DR, worse in Wild for some classes, better in Wild for others. It's worth comparing this to Ethereal Conjuror - it was 5 cost, 6/3, discover a spell. So is one extra mana worth the worse stats and only getting a 5+ cost spell? Not sure if it's worth a deckslot tho. The idea behind the card is fine but stats are simply bad for 6. The art in gold going to be amazing though! Arena card pretty much just for the added value of the battlecry. The stats are not ideal though even taking that battlecry into consideration. You would more likely see this as a 5 mana minion, but it is set to 6. Will be really good in classes that don't have a ton of high cost spells. Warrior for example has Brawl, The Boomship, Lesser Mithril Spellstone, Unidentified Shield, Sudden Genesis, Deadly Arsenal, and Gather Your Party. The odds of only pulling three terrible cards out of that pool is pretty low. I’m not sure what to think of this one. It’s a powerful effect because you can be reasonably sure of what you’ll get. Most big spells are not only powerful but can define your deck. However the body is weak and it’s hard to cast the spell the same turn you draw it. I could see this in a defensive deck... maybe in a value Shudderwock deck if that ever exists. But it’s pretry bad against agro.